This is a wall hanging life-cast of Jonathan Harris made as a display piece. 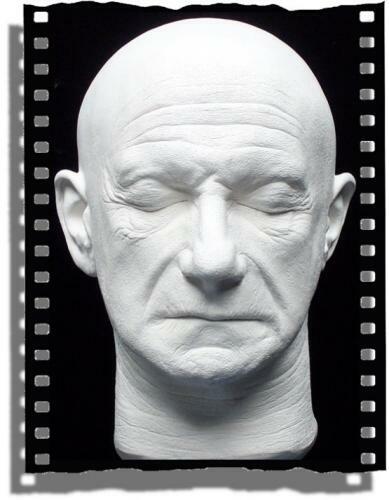 This is a 3/4 life-cast of Jonathan Harris that has been professionally restored. The origin of the original casting was from the "Lost in Space" episode - "The Space Destructors". Smith finds an android-creating device and makes himself a set of conquering soldiers who look exactly like him, and dreams of conquering the galaxy. In trying to stop him, Will Robinson falls into the machine, and emerges with Smith's face and a lust for killing. 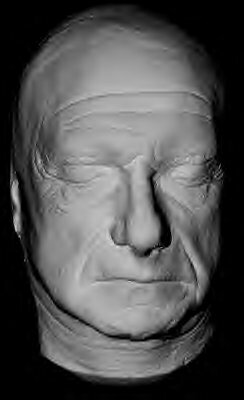 This life mask is a full life size casting of the front 3/4 of Jonathan Harris's face. The original casting was used to create special effects made for that episode. This restored version has both ears completely sculpted, and pore detail meticulously added for realism. The casting is made of U.S. Gypsum's White Hydrocal. There are some slight bubbles, but overall extremely "sharp" detail on this casting. It has a sturdy metal wire loop in the back for hanging on a wall.